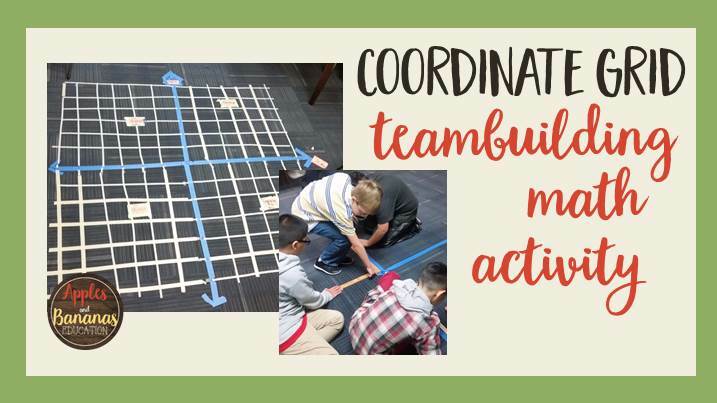 To kick off the second semester, and to give my math students a team-building experience, I decided to do a hands-on activity with coordinate grids. I did this with a mixed-ability group of 5th and 6th graders. 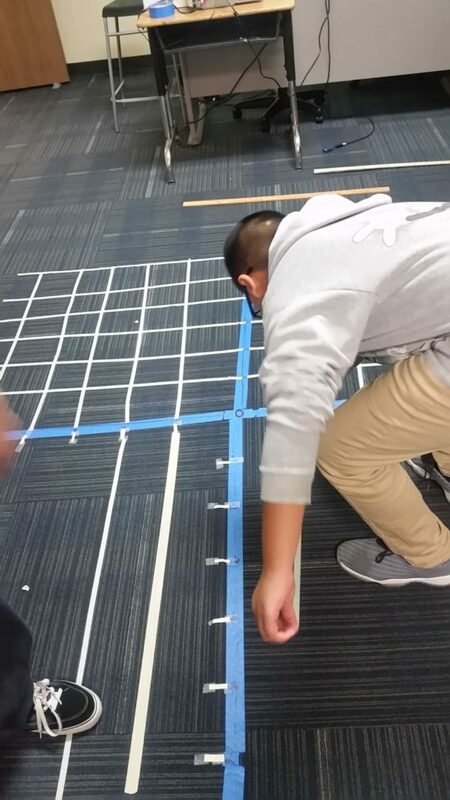 I put a sample coordinate grid up on the document camera, and told the students that their task was to create a coordinate grid on the floor using the materials provided. I asked them to have their coordinate grid go to the number 6, be big enough to walk on, and contain all of the lines shown. I told them to make the “north” or “top” of the coordinate grid face the document camera. We briefly reviewed our “expectations for group work” anchor chart and then I set them loose. It didn’t take long for the students to use the yardsticks to make the “x” and “y” axis on the ground. A few students jumped right in, and it took a bit of prompting for the others to find “jobs” for themselves. More rolls of tape would have been good and sped up the process, but it was fun seeing the students challenged to include everyone in someway. 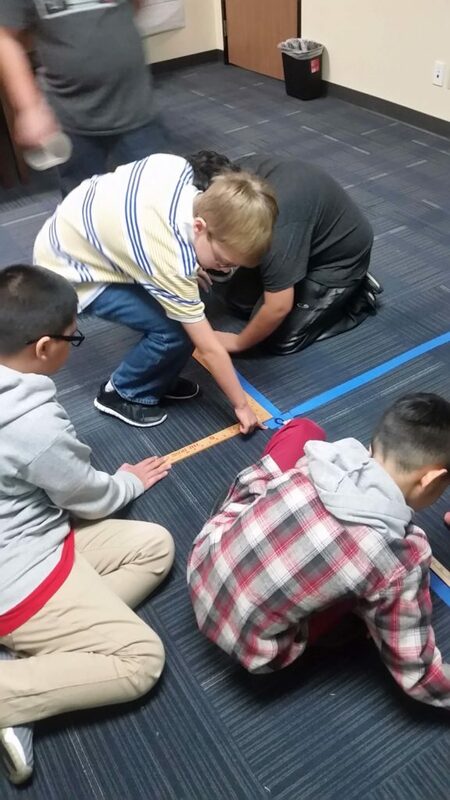 Eventually half of students worked on cutting the tape to equal lengths, while the other half laid the grid out on the floor and labeled the x and y axis. They talked and agreed that the blue tape would be the main x and y axis lines, and that they would use masking tape for the other lines. One student suggested that they lay the white tape underneath the blue tape so that the numbers could still be read, but in the end they agreed to simply start the white masking tape at the very edge of the blue tape. We had a few minutes at the end of class, so I had the students label the x and y-axis, along with the four quadrants. About half of the students had never been introduced to the word “quadrant” before,so the more experienced students explained the four quadrants and then they taped index cards in the appropriate quadrants. They then insisted on “signing” some part of the grid, so it’s obvious that they all wanted ownership of their contributions. The activity took around 35 minutes with my class of 8 students, plus additional time for moving the furniture. I would definitely leave more time than you think you would need, and in a traditional classroom setting, I would recommend groups of 4 or 5, so that everyone has a chance to be really involved. If you do multiple groups of students, it would be good for groups who finish early to have an independent activity as they are waiting for other groups to finish up. 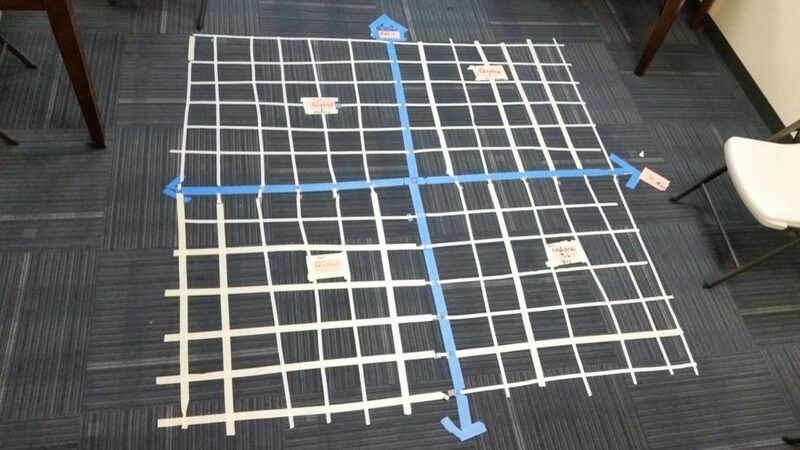 Click here to see our next blog post about what we actually did with our coordinate grids during the next class time. Wow, this is awesome! I’m all for learning activities (especially for math!) that get kids moving and thinking and interacting. I bet they remember this concept for a long time! I am a big fan of team-building activities! They are an authentic way to learn how to communicate effectively with others, which is a skill that many adults lack! Way to integrate math and interpersonal skills! What grade did you use this in?